The Waterfront Place Hotel welcomes event planners to explore all the Waterfront has to offer this holiday season. To make the offer more enticing, the hotel is currently offering 20% off for all holiday celebrations held Sunday through Thursday. 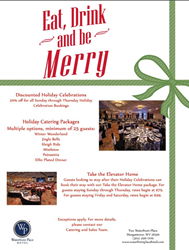 With delectable holiday catering packages, including Winter Wonderland, Jingle Bells, Sleigh Ride, the Waterfront Place Hotel is sure to delight all holiday party goers. For guests looking to stay the night after their holiday party, Waterfront Place is offering the Take the Elevator Home package. Guests looking to stay Sunday through Thursday nights will enjoy a rate beginning at $79 per night. Guests staying Friday or Saturday night will enjoy rates beginning at $99 per night. For more information about these great offerings, please contact the Sales and Catering team at (304) 581-2800. The Waterfront Place Hotel, located along the Monongahela River in Morgantown, West Virginia, offers guests a beautiful, full-service experience. With 205 deluxe guestrooms and plentiful amenities, Waterfront Place is perfect for business and leisure travelers. Guests may enjoy luxurious bedding, free high-speed Internet, indoor pool, state-of-the-art fitness center, on-site dining at Regatta Bar & Grille and much more. Accommodations include king or double queen rooms, Riverview rooms, suites and accessible rooms upon request. With over 50,000 square feet of meeting and event space, the Waterfront Place Hotel is perfect for conferences, meetings, weddings or special occasions. Conveniently located a short distance to downtown Morgantown, Waterfront Place is a mile from West Virginia University and within easy distance to local golf courses, wineries and much more. For more information and to make a reservation, please visit http://www.waterfrontplacehotel.com. The Waterfront Place Hotel is proudly managed by Stonebridge Companies in Denver, Colo. Founded in 1991 by Navin C. Dimond, Stonebridge Companies is a privately owned, innovative hotel owner, operator and developer headquartered near Denver. Its diverse listing of properties includes select-service, extended-stay, mid-scale and full-service hotels in markets throughout the U.S. For more information, visit http://www.sbcos.com.